My December 2017 trip ended with a virgin flight with Batik Air that's owned by the Lion Air Group headquartered in Jakarta, Indonesia. Unlike Lion Air, it's a full service airline. 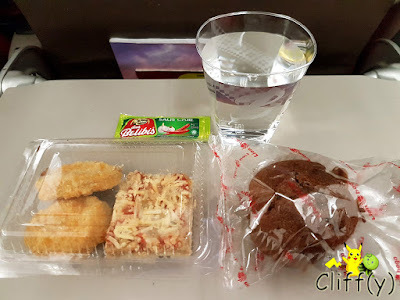 For the short-haul flight from Jakarta to Singapore and vice versa, snacks are provided for Economy Class passengers. They're included in the ticket price. Given that I had a fulfilling lunch at Pondok Laguna, those were enough for dinner. Two pieces of chicken nuggets were packed in a plastic packaging. I ate them with the garlic chili sauce provided, which was fiery and tasty enough. Inside the same packaging was a square pizza bun topped with minced beef, tomato sauce and grated cheese. It actually tasted decent, but somewhat dry. I didn't expect a lot from the chocolate muffin, but it turned out to be the best item for the evening as the chocolate taste was pretty rich. Also, it was adequately moist. If I remember correctly, there were only mineral water and hot tea available. I didn't try the latter. 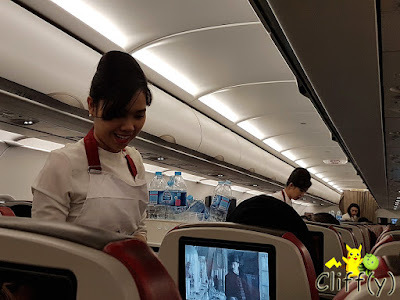 The flight attendants served with smiles pencilled on their faces. 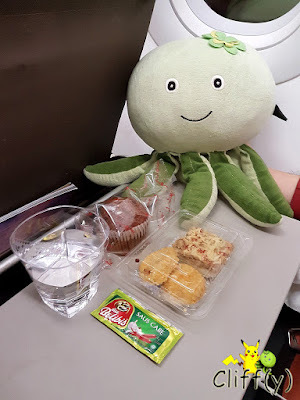 Pika's advice: Should you wish to pay just a bit more to fly in the Business Class cabin, you'll get a proper meal.